Wondering what goes into making a viral cat video? Check out our seven tips, plus some insight from a pro. 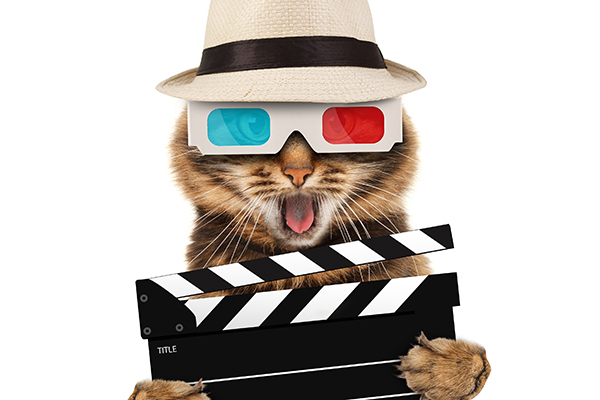 Who hasn’t dreamed of having their cat star in a video that’s taking the internet by storm? Most of us have captured cute, funny or endearing moments of our cats on video, but the reach has only gone as far as Grandma, Aunt Doris and our best friend from high school. Is it just luck or are there tactics for making a viral cat video? As you know, with cats, there’s no predicting anything, and everything is possible; however, there are a few tips that may help you pick up traction online — and even go viral! Trying to get a good video? Sometimes, you just need to wait for it. Photography ©kicia_papuga | iStock / Getty Images Plus. Most cats don’t want anyone telling them what to do and prefer to stick to their own timing, thank you very much. Trying to persuade a cat to be hilarious on command might not get you anywhere but frustrated. Sometimes, we manage to immediately capture the sweetest kitty cuddle moment ever, but mostly we wait around with our cameras or phones, hoping for something interesting to develop. 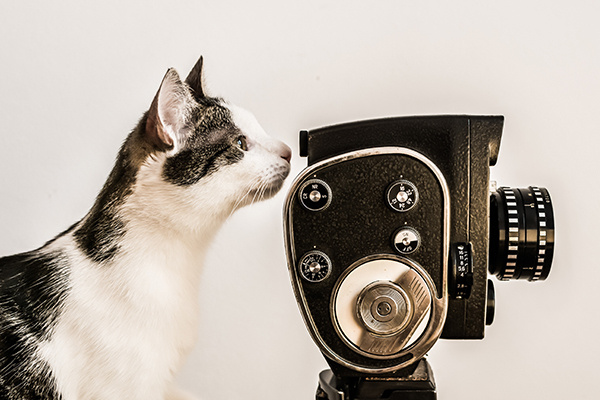 If you want to snag a winning video, you’ll probably need to be OK playing the waiting game — and sometimes following your cat from room to room, looking for video gold. Or, just always having your smartphone handy and ready to record. Ask yourself if you’d randomly watch the video you’ve recorded. Viral cat videos usually have a hook and last somewhere between 5 to 15 seconds. They typically feature feline activity that’s either cute, funny or unique — sometimes all three! You don’t need a fancy, expensive camera. These days, mobile phones come equipped with fantastic cameras that take crisp, clear videos. Avoid posting footage that’s out of focus or jerky, though. Some viral videographers use music to complement the on-screen action. This can be a great idea, as long as there is no copyright infringement. Please don’t put your kitty in any situation that might be dangerous, harmful or make her uncomfortable just to get attention. If your cat seems annoyed, scared or distressed, stop shooting the video and let her decompress. Staged cat videos will only work if your cat has the right personality. Photography ©AnatoliYakovenko | iStock / Getty Images Plus. It’s true — sometimes staged scenarios can result in overwhelmingly popular cat videos (think: a cat in shark costume riding a Roomba). 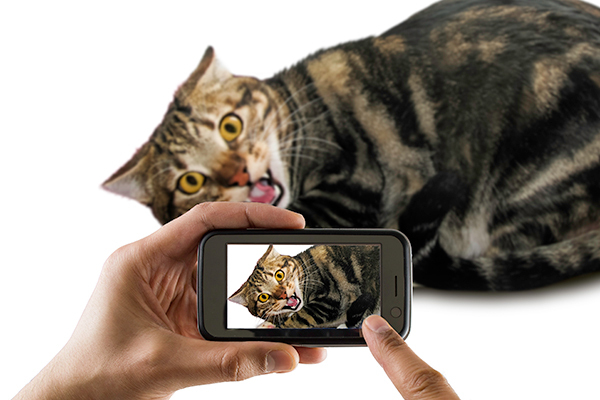 If your cat is patient or takes direction well, you may be able to create a video masterpiece. If you have editing skills (or know someone who does), you might want to try your hand at producing something with a little more polish. There are some hilarious spoof videos starring cats floating around out there. Put on your pop culture cap and think about how you might piggyback on what’s current. Chances are, the parody would be based on something with which the audience is already familiar, so you’ll automatically have a leg up. But remember, you know your cat better than anyone. If she’s not comfortable wearing a hat or meowing on command along to “Mary Had a Little Lamb,” don’t even go there. Aaron Benitez of Aaron’s Animals produces videos that rack up millions and millions of views. This is all thanks to his special-effects skills and his very agreeable cat, Prince Michael. Benitez told ABC News, “I got Prince Michael a couple of years ago, and I noticed he was a super chill cat, so I started making these videos.” And these videos are nothing short of roll-on-the-floor hysterical. So, you’ve made the cutest, funniest and coolest video ever. Now what? Share your work near and far! Post it on your social media outlets, and ask your friends and family to share it as well. Use popular hashtags, and tag publications that might share the video or brands that you’ve featured. If it picks up steam, it may end up being featured on a major site or social channel, where the odds of it becoming viral are definitely improving! Remember that creating a wildly popular cat video doesn’t require expensive equipment or a storyboard (although you could have both of those). The main keys are to be patient, know your cat, record quality content and share, share, share! Tell us: Do you love taking cat videos? Stay tuned on Catster.com for fun cat videos coming soon. Tag your own share-worthy cat videos with #catstercats on Instagram.